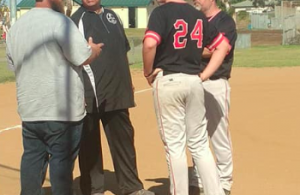 SPRING VALLEY (4-4-3-2019) – In a pitchers’ duel seemingly destined for extra innings, Mount Miguel senior Cameron Beauzec felt no hankering to stay late. Instead, the catcher belted a walk-off, 3-run homer Wednesday (Apr. 2), powering the Matadors to a 4-1 verdict over visiting El Capitan. Beauzec lined the first pitch over the left-field fence, also bringing home teammates Austin Ortiz and J.D. Laverdiere. Both baserunners reached on two-out singles. Obviously, the El Cap pitcher wanted to get ahead, but by being both a catcher and a pitcher, Beauzec guessed correctly on the pitch and swung at the first offering, belting his first home run of the season. “I felt really good when I hit that ball,” Beauzec said. “Almost felt like I didn’t touch it. I just knew once I saw it leave my bat I was jogging home. It really felt good to hit this one for my team today because we needed it. And today we really fought hard. The blast made a winner of Matadors pitcher Nico Camacho, who threw a complete-game to beat the Vaqeuros with the lone run allowed coming unearned in the 5th. Mount Miguel opened the scoring when Ortiz scored for the firwst time. He led off with a single, moving on to third base. But with two outs, an error allowed him to score an unearned run. Mount Miguel (4-10 overall, 2-3 GVL) has now defeated two of the top three contenders in the league. They earlier downed Valhalla in the GVL opener, while have yet to play first-place Steele Canyon. For El Capitan (4-9, 2-1 GVL), third baseman Kevin Allison batted 2-for-3. STEELE CANYON 6, WEST HILLS 4: At western Santee, Cougars slugger Billy Tellous pounded his CIF-SDS co-leading fifth home run of the season — a tie-breaking, 2-run shot in the 5th inning — to give Steele Canyon undisputed possession of first place in the Grossmont Valley League. Tellous belted a shot to that went through the top of a 40-foot eucalyptus tree in right field, a shot estimated at between 415-430 feet. It was his fifth homer of the season. Meanwhile, Audrey Bagge, Tellous’ girlfriend, hit her East County-leading sixth homer of the season for the victorious Steele Canyon softball team, also on Wednesday. Talk about a power couple. “I texted her to see how she did and waiting for a response I had to know and she hit another one and I am still one home run under her,” Tellous said. “And if she has any say about it, I won’t be passing her. Tied at 3-3, Cougars No. 9 batter Cade Stein dropped a lead single to left field. Stein was still at first base with two outs before Tellous fouled off a 2-2 pitch, then went deep on the next offering. “After I hit it, I knew that we would have to hold them and (Jack) Schlotman did the best he could and I’m glad I could give him the win. West Hills quickly got one run back when “Killer” Joe Thrailkill accepted a lead walk. He was bunted to second by a two-strike sacrifice by Peyton Honick, then scored on a sharp single to left by Devin Bevilacqua. However, the Cougars defense started to take over to barely maintain the lead. 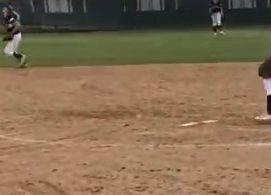 The Cougars got out of the 5th in a nice fielder’s choice by shortstop Sebastian Granados, although West Hills though Bevilacqua beat the throw to second base. In the 6th, a leadoff walk was erased when second baseman Eli Page grabbed a hard grounder, as Granados made the turn at second for a double play. Two batters later, the defense pair converted another fielder’s choice to get out of the inning. Then in the 7th, West Hills loaded the bases with a two-out rally. However, Brad Barkley was summoned from the bullpen, coaxing yet another ground ball to Page to register the save. Early on, the Wolf Pack led 1-0, but Steele Canyon scored three times in the 3rd, capped by a 2-run double by Aaron Taylor. However, West Hills immediately pulled even on a Thrailkill triple to deep center, scoring Anthony Masters and Kole Klingerman, who both walked. 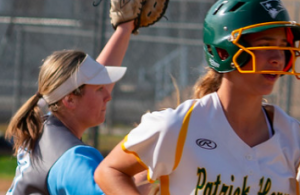 However, the Cougars defense escaped again on a fielder’s choice for an out at the plate as the catcher fielded a bunt, then lunged back toward the plate for the tag out. Steele Canyon (9-5 overall, 4-0 GVL) received two hits each from Jake Entrekin, Richard Pedrin and Cade Stein. Schlotman went the first four innings, striking out five for the Cougars. Jonathan Kenney went 2 2/3 innings, while Brad Barkley got one out for the save. “Bill is the most clutch hitter we have,” Schlotman said. “He really came through today with that bomb. Seems like every game he puts one out. West Hills (3-12, 2-3 GVL) saw the heart of its lineup hit well as Bevilacqua and cleanup batter Cody Pedrero register two hits each. 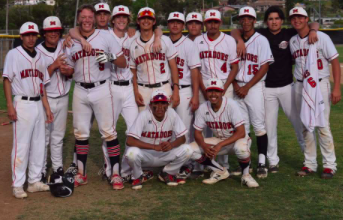 MONTE VISTA 18, EL CAJON VALLEY 0: At ECVHS, the Monarchs’ Abraham Sanchez and Andy Canedo combined on a 2-hit shutout of the Braves in a Grossmont Valley League game. Sanchez went five innings, striking out eight batters. He also drove in four runs. 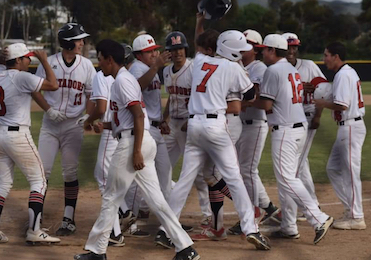 Monte Vista (9-8 overall, 1-2 GVL) scored seven times in the 6th to invoke the run rule. Canedo was also the Monarchs batting leader, going 3-for-5 with double, collecting three runs and a pair of RBI. Meanwhile, Alan Alarcon came off the bench to register two base hits. “It was just a good team win,” Monte Vista head coach Craig Neu said. “All of our players game ready to play. I was happy to get all my bench players into the game because they work hard at practice every day. El Cajon Valley (1-8-1, 0-4 GVL) received hits from senior Robert Verdugo and junior Mario Jacobs.